When one thinks about the Second Broadway Golden Era — roughly the post-Fiddler era to the British Invasion of the 1990s, there are a few major composing teams that come to mind — teams that characterize that era. Once of these folks was Stephen Sondheim. His successes from those days are well known — shows like Sweeny Todd or Into the Woods. Other shows were only moderate successes when first performed, but have grown into legends subsequently, such as Company or Follies. Still other shows have remained problematic and are rarely produced, such as Passions, Anyone Can Whistle, or Merrily We Roll Along. I’ve had concert or revival versions of the latter two on my iPod of late, and I’ve been growing to appreciate the music, recognizing how many of the songs from these shows have gone on to a longer life, even if the show was recognized as problematic. Enter the Colony Theatre (FB). We are former Colony subscribers. After they had a second run of financial trouble, the producing side of the company went dormant, and they focused on leasing out the space and offering classes to make the rent and to presumably keep the City of Burbank happy. The shows they have brought in have been hit or miss over the years, and we’ve skipped most of the offerings (although their guest production of Funny Girl a couple of years ago was good). 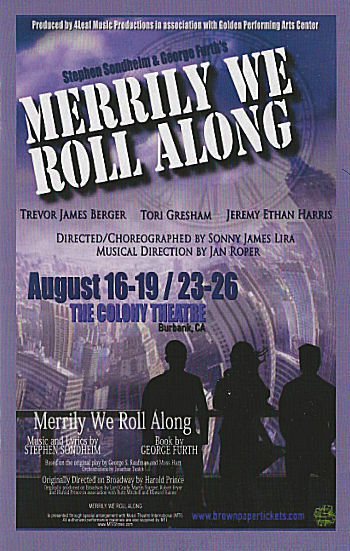 But one of their guest productions this summer piqued my interest: 4Leaf Music (FB), a new producing company, together with Golden Performing Arts Center (FB), a Canoga Park-based non-profit that trains young actors, had teamed up to present Merrily We Roll Along at the Colony. As this was a Sondheim show — in particular, a Sondheim show I had only heard but never seen — plus it was one of those legendary Sondheim flops (it ran for only 52 previews and 16 performances) — I had to figure out a way to see it. Luckily, the timing worked out, and so we were back at the Colony last night for Merrily. I must note that every time we visit the Colony venue these days I’m filled with a sense of melancholy. What was once a great company is gone. The walls once filled to the brim with years of photos of productions are now empty. The furniture pieces in the lobby, which were leftover props from past productions, are gone. A few towers with set designs from productions are all that remains. Even the artistic director, Barbara Beckley, has gone Emerita and her spirit doesn’t permeate the halls or the stage. What went wrong? Where did this company veer off course and flounder? When was the seed of destruction sown; when did the artistic notion that propelled them go by the wayside? As I said melancholy — and looking back now, an interesting echo of the story to be told on stage. It was like, say, presenting a production of Follies in a theatre that had been long closed and was reopening just for that show before being torn down. Which brings us to the story of Merrily We Roll Along, which featured a book by George Furth, based on the original play by George S. Kaufman and Moss Hart. Merrily tells the story of Franklin Shepard, a producer of Hollywood movies, chasing after fame and money. As with the original play, it starts with him at the top of his fame, after multiple divorces, with his current wife learning of his affair with the leading lady in his movie, which was to have starred her, with an estrangement from his best friends, Charlie Kringas (his lyricist) and Mary Flynn (a writer and theatre critic) who helped him get started. This is in 1976. As with the original play, it then moves backward in times, showing key moments about of where it went wrong, of where he snatched seeming victory (but really defeat) from the arms of time. 1973. 1968. 1966. 1964. 1962. 1960. Finally, 1957, where we see him move in with Charlie and meet Mary for the first time. You can find a more detailed synopsis on the Wikipedia page; the 1994 synopsis presented there reflects the show at the Colony. Whereas the original play was a somewhat success for its time (151 performances in 1934); the first version of the musical was a failure. The staging had lots of problems. The themes — about abandoning ones dreams for commercial success — were not well received at the time, and the reverse chronological approach made the show difficult to understand. There were also some problems with the structure of the score, which were remedied to an extent in subsequent revisions and revisals, leading to the 1994 version that was performed at the Colony. Did they succeed in fixing the problems of the show? My wife found the show ponderous. I thought it was interesting, but that the backward time structure hindered the storytelling. It forces you to start out with people who you don’t like, and over emit (time, backwards), learn what they did to make themselves unlikable, instead of learning why you like them. The backwards structure provides the 20/20 hindsight that allows the audience to think they know better by providing “aha, that’s why” moments and “oh, no, don’t do that moment”. Using conventional time would have worked better: you would see the character arcs of how the person changed with the foreshadowing. Further, the reverse nature of the story necessitated musical transitions to take the back in time with the people on stage — and these transitions slowed the narrative without adding to the story. In short, the book remains problematic — and problematic in a way that may never be easily resolvable. This show may be the Mack and Mabel of Sondheim’s catalog: the show that got away. The show with great music that had an incurable book. As such, it will remain a piece of fascination — a piece that will be reexamined to see what went wrong, and where were the signals that were ignored. The impetus to stage this production started about 12 years ago, when Trevor Berger [the actor playing Franklin Shepard] was in a “Merrily” production with L.A.-based Musical Theatre Guild, playing Frank’s son, Frank Jr. “I fell in love with the show,” Trevor Berger said. His father decided to mount a production, which will have a full orchestra, as the younger Berger gets ready to move to New York City. “It’s a big send-off party for him,” Rick Berger said. While the performances in this show were mostly very strong, the first production nature of the show did show through at points on the production side. More on those production problems in a bit. Under the direction of Sonny James Lira (FB), who also did the choreography, the cast brought a lot of energy onto the stage. Theatrically, they did a great job of inhabiting their characters and bringing them to life. The movement was satisfactory, but at times the dance side was a bit baffling, as I couldn’t see what story or message the movement was bringing. Movement shouldn’t just be there for movement sake, it should enhance the story. However, the performances were, for the most part, quite strong. In the lead position, as Franklin Shepard, was Trevor James Berger (★FB, FB). I was unsure about Berger at first — he didn’t have the right look of the character for me. But his performance grew on me, and by the end I quite enjoyed his performance, He had a very pleasant singing voice, and he embodied the character quite well. I had no such questions about the other leads: Jeremy Ethan Harris (FB) as Charlie Kringas and Tori Gresham (FB) as Mary Flynn. Harris had a lovely and strong singing voice, and a strong personality that he brought to the character making him warm and likable. Later in the show, a comparison struck me between Harris and a young Richard Kind, who worked with Sondheim on Bounce, later retitled Side Show. Greshman’s Flynn was a delight. She had a wonderfully unique and strong singing voice, and her performance had elements of both Stritch and Merman. She’s an actress I hope to see on the stage again. Her performance was that strong. In the second tier of characters, a particularly notable performance was Sarah Ryan (FB) as Beth Spencer, Frankin’s first wife. Strong performance, strong singing, good movement, good personality — and did I mention that she had a great voice. I was less taken with Renee Cohen (FB)’s Gussie Carnegie (Franklin’s second wife). There was just something off in her characterization and performance that I couldn’t put my finger upon. Technically adept, but there was a sense of “trying too hard” in either the look or the acting that missed the mark slightly. I don’t mean to imply the performance was bad — it wasn’t. But it needed something different in the characterization that I couldn’t quite put my finger on. Rounding out the second tier of characters was Brian Felker (FB) as Joe Josephson, as Franklin’s producers and Gussie’s Ex, and Vince Venia as Franklin Shepard Jr. Felker gave a strong performance within the confines of his character; I particularly liked him in “Opening Doors”. Venia did what any child actor must do: look cute while believably being a character’s kid. Both worked. This brings us to the ensemble. There are a few performances of members of the ensemble worth particularly noting: Taylor Bass (FB) [Meg, Ensemble] was a particular standout: there was something about her look, her voice, and her performance that just drew my eye to her. Also strong was Shaunte Nickels (FB) [Scotty, Evelyn, Ensemble] — she had a very strong voice and brought a nice character to her track. I also liked the look of Ashley Knaak (FB) [TV Newswoman, Mrs. Spencer, Ensemble] and her voice, although the wardrobe her track had problems. Rounding out the ensemble (named roles indicated) was: Logan Allison (FB) [Terry, TV Newsman, Mr. Spencer], Riley Boronkey (FB) [Dory, Jerome], Aaron Camitses (FB) [Make Up Artist, Photographer], Donna Kim (FB) [KT], Josiah Lucas (FB) [Tyler, Judge], and Christopher J. Thume (FB) [Ru, Minister]. Music was provided by a live orchestra, under the musical direction of Jan Roper (FB) [Conductor, Keyboards]. In addition to Roper, the orchestra consisted of Ann Kerr [Woodwinds], Peter Miller [Woodwinds], Anne King (FB) [Trumpet], Andrew Lippman (FB) [Trombone], Christian Klikovits (FB) [Synthesizer], Steve Billman (FB) [Bass], and Alan Peck [Drums / Percussion]. This brings us to the remaining production aspects of the show, which is where most of the problems revealed themselves. Effy Yang (FB)’s set design was simple — perhaps too simple — consisting of a number of movable platformy-stagey things and simple projections that were drowned out by the lighting. Two problems here. First, the stage pieces didn’t convey that much of a sense of place, so it was difficult to distinguish where something was happening. The projections didn’t help all that much in that regard; they also had some jerky motions that served to distract. The sense of place — and more importantly, time — can also be conveyed through the costume design, and the hair and makeup design. This was the second place that was problematic. Michael Mullen (FB)’s Costume Design was sometimes period-right and sometimes period-wrong, and it was often paired with the wrong hairstyle for the period, providing chronic-dissonance. There were also distracting costume failures (my wife noted a seam on a suit), odd gaps, and outfits that appeared to be too tight or misfitted. Some of this might come with the financial constraints of a production such as this for a new company, but they remained distractions from the show. Even if you must compromise, you must do so in a way that doesn’t unduly distract the audience. Slightly less problematic was the Zachary Titterington (FB)’s lighting design. Here, the problem was that the occasional actor on the side of the stage was not lit, so they were performing in darkness. Not in darkness, however, were the upper wings. The orchestra, of course, can’t be dark, but the curtain can be adjusted to minimize their operating lights. On the stage left upper wing, there was no reason for the work light to be on when the actors weren’t up there. Again — distractions. Rounding out the production team was Riley Boronkey (FB) [Asst. Choreographer], Manichanh Kham (FB) [Stage Manager]. Rounding out the creative credits: Jonathan Tunick [Original Orchestrations]; Harold Prince [Original Direction]. There is one more weekend of performance of 4 Leaf/GPAC’s Merrily We Roll Along. Tickets are available through Brown Paper TIckets. Although there are some flaws on the production side, and the book of the show remains problematic, the energy and enthusiasm of these performers does elevate the production and makes this rarer show worth seeing. The last weekend of August will bring more Shakespeare — this time Macbeth at the Lake Tahoe Shakespeare Festival (FB). Looking forward to September: The first weekend of September is currently open, but I’m looking for shows in the Sacramento area. The second has a hold date for I Dig Rock and Roll Music at the Rubicon in Ventura — whether we go depends on ticket prices. The third weekend has Ain’t Too Proud at the Ahmanson Theatre (FB) on Friday, followed by Paradise – A Divine Bluegrass Musical Comedy at the Ruskin Theatre (FB) on Saturday. The fourth weekend has Rope at Actors Co-op (FB), and the fifth brings Bark: The Musical at Theatre Palisades (FB). October is also getting quite full. It starts with Oppenheimer at Rogue Machine Theatre (FB). The following weekend has a HOLD for Moon River -The Music of Henry Mancini at the Saroya [the venue formerly known as the Valley Performing Arts Center (VPAC)] (FB) — I’m just waiting for tickets to come up on Goldstar. The third weekend of October brings Shrek at 5 Star Theatricals (FB). October will close with the Contemporary Crafts Show in Pasadena. Continuing the lookahead: November starts with She Loves Me at Actors Co-op (FB) and Stitches So Cal. The second weekend of November is very busy: Dear Even Hansen at the Ahmanson Theatre (FB) and A Bronx Tail at the Hollywood Pantages (FB), as well as A Day Out With Thomas at Orange Empire Railway Museum (OERM) (FB). The third weekend of November brings Finks at Rogue Machine Theatre (FB). Thanksgiving weekend has a hold for Steambath at the Odyssey Theatre Ensemble (FB). December starts with the Annual Computer Security Applications Conference (ACSAC), followed by a hold for the Canadian Brass at the Saroya [the venue formerly known as the Valley Performing Arts Center (VPAC)] (FB). Then we may travel up to the Bay Area for Tuck Everlasting at TheatreWorks Silicon Valley (FB). Lastly, January will start with Bat Out of Hell at the Ahmanson Theatre (FB).